What does For Your Nails Only specialise in selling? I am an indie nail polish maker. An indie nail polish maker is an independent maker who makes everything by hand from scratch. Where is For Your Nails Only based? Yes, I have a website, through which customers can place their orders, but I only ship within the UK. International shipping regulations class nail polish as a prohibited item, because its flammable, so I am not allow to ship internationally. I am exploring other shipping/transport options at present. What inspired you to create a business that solely focuses on vegan nail polishes? I, myself am not vegan but an animal lover nonetheless. I have always been against animal testing and personally use beauty products that are cruelty free. Fortunately, my suppliers provide ingredients that are cruelty free and vegan friendly, so I can offer the same to my customers. The majority of suppliers I use stock them so it's fairly easy. Do these ingredients effect the outcome in comparison with non-vegan nail polishes? According to my customers, they are actually better! I have had great feedback from my customers saying my polish lasts better and stays very shiny and glossy, compared to other ones. For new customers who don't know what to buy; is there a particularly popular item you can name? My most popular polishes are thermals, these have thermochromic pigments in them. These are heat sensitive so change colour at approximately 30 degrees. They change colour when one's body temperature changes or when external factors bring about this effect e.g. putting your hands into different temperatures of water. Is For Your Nails Only owned by, or in partnership with, another company that tests on animals or sells non-vegan products? My name is Sharon Faulds. I live with my husband and grown up son. I have always loved having nice nails, different polishes, nail art, glitter and anything basically nail related! Pursuing my hobby led me down the path of first sampling an indie polish a few years ago and I loved it. Being a tad creative and wanting to pursue my own ideas, I did some research and decided to buy some basic ingredients to develop my own nail polish ideas. Over time I started to share and showcase my creations on my social media pages and was flattered and amazed when others wanted to buy them. For me, there is nothing more satisfying than getting my nail polish admired knowing that I have made it, or someone else wanting to buy and wear a polish that I have made. I therefore decided to set up a very small business selling it along with a few other nail products. What is your vision for the future of For Your Nails Only? To keep restocking as fast as I can, in order to keep up with the demand for my polishes! Meanwhile my next collection is called “Cupid Collection” and will be available on 3rd February. 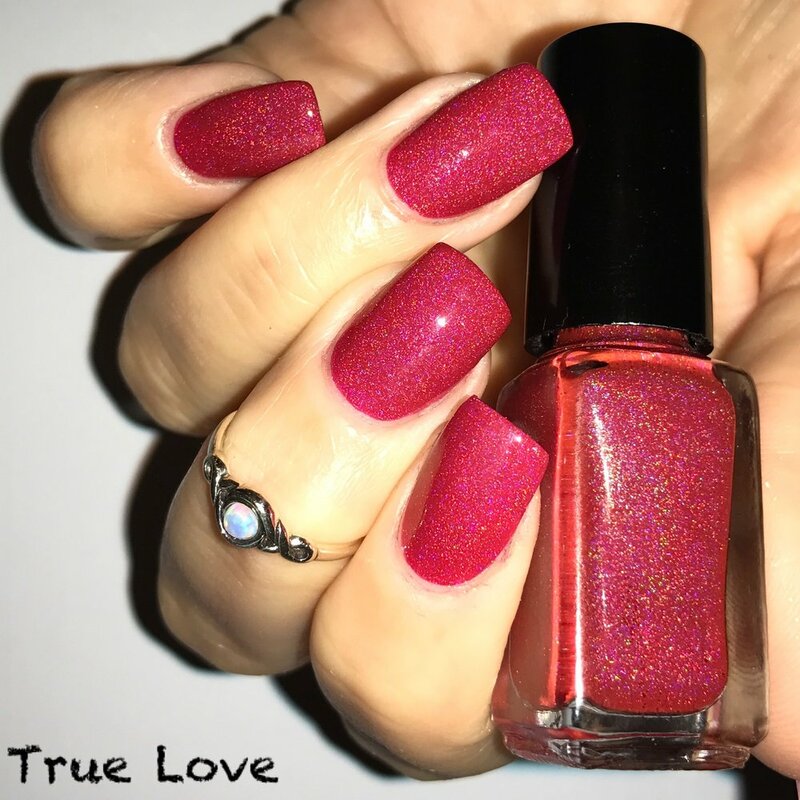 "True Love" a raspberry coloured linear holographic polish & "Desire" a black to purple thermal polish with luxurious underlying gold and violet sparkle flakes, will be part of this range. I am currently in discussions with beauty salons, vegan shops and others, re stocking and selling my products. I have been inundated with requests to supply my polishes to customers in USA, but as previously mentioned currently, I cannot ship there due to international shipping regulations.